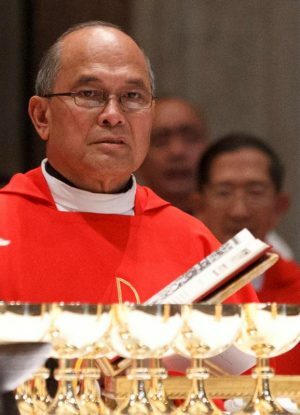 VATICAN CITY (CNS) — The Vatican’s Congregation for the Doctrine of the Faith has rejected an appeal by the now-former Archbishop Anthony S. Apuron of Agana, Guam, upholding its judgment of finding him guilty of abuse against minors. The doctrinal tribunal’s decision is final and no further appeals are possible, it said in a communique published April 4. “The penalties imposed are as follows: the privation of office; the perpetual prohibition from dwelling, even temporarily, in the jurisdiction of the Archdiocese of Agana, and the perpetual prohibition from using the insignia attached to the rank of bishop,” it said. The 73-year-old member of the Order of Friars Minor Capuchin was ordained a bishop in 1984 and he “sacramentally” remains a bishop, Alessandro Gisotti, interim director of the Vatican press office, told reporters April 4. However, Gisotti added, Bishop Apuron has been formally removed from the “office” of archbishop of Agana, where he was installed in 1986, and his removal from “ecclesiastical office” means he may no longer wear the usual “insignia” associated with it, such as a bishop’s ring, miter and staff. “Our church on Guam can now continue with certainty, our collective journey toward healing and reconciliation. Most importantly, the victims, survivors and their families who have suffered greatly can have some measure of solace that justice has been rendered in the church’s tribunal process,” he wrote. In a written statement released by his lawyer, Bishop Apuron said child sexual abuse is an “abhorrent crime” that demands a transparent search for the truth, justice and compassion for survivors. “A particular bishop has to be judged and so the pope sets up a jury more capable of taking that case,” he said, explaining that the tribunals and juries change for each case. “This is the way we have done things up to now. A number of bishops have been judged this way; the latest was the archbishop of Guam, who appealed his sentence,” Pope Francis said. “I decided — because it was a very, very complex case — to make use of the right that I have, hear his appeal on my own, and not to send him to the appeal court that carries out its work with priests,” the pope said. By taking it up personally, the pope “set up a commission of canon lawyers to help me” and offer a “recommendation” so the pope could make a judgment. “It is a complicated case on the one hand, but not difficult, because the evidence is extremely clear; from the standpoint of evidence, it is clear,” the pope said.